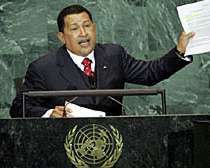 President Hugo Chavez's Speech to the United Nations, Sept 16, 2005. The original purpose of this meeting has been completely distorted. The imposed center of debate has been a so-called reform process that overshadows the most urgent issues, what the peoples of the world claim with urgency: the adoption of measures that deal with the real problems that block and sabotage the efforts made by our countries for real development and life. Five years after the Millennium Summit, the harsh reality is that the great majority of the goals - which were very modest indeed - will not be met. We pretended reducing by half the 842 million hungry people by the year 2015. At the current rate that goal will be achieved by the year 2215. Who in this audience will be there to celebrate it? That is only if the human race is able to survive the destruction that threatens our natural environment. We had claimed the aspiration of achieving universal primary education by the year 2015. At the current rate that goal will be reached after the year 2100. This UN does not work. We have to say it. It is the truth. Friends of the world, this takes us to a sad conclusion: The United Nations has exhausted its model, and it is not all about reform. The 21st century claims deep changes that will only be possible if a new organization is founded. This UN does not work. We have to say it. It is the truth. These transformations - the ones Venezuela is referring to - have, according to us, two phases: The immediate phase and the aspiration phase, a utopia. The first is framed by the agreements that were signed in the old system. We do not run away from them. We even bring concrete proposals in that model for the short term. But the dream of an everlasting world peace, the dream of a world not ashamed by hunger, disease, illiteracy, extreme poverty, needs - apart from roots - to spread its wings to fly. We need to spread our wings and fly. We are aware of a frightening neoliberal globalization, but there is also the reality of an interconnected world that we have to face not as a problem but as a challenge. We could, on the basis of national realities, exchange knowledge, integrate markets, interconnect, but at the same time we must understand that there are problems that do not have a national solution: radioactive clouds, world oil prices, diseases, warming of the planet or the hole in the ozone layer. These are not domestic problems. As we stride toward a new United Nations model that includes all of us when they talk about the people, we are bringing four indispensable and urgent reform proposals to this Assembly: the first; the expansion of the Security Council in its permanent categories as well as the non-permanent categories, thus allowing new developed and developing countries as new permanent and non-permanent categories. The second; we need to assure the necessary improvement of the work methodology in order to increase transparency, not to diminish it. The third; we need to immediately suppress - we have said this repeatedly in Venezuela for the past six years - the veto taken by the Security Council, that elitist trace is incompatible with democracy, incompatible with the principles of equality and democracy. And the fourth; we need to strengthen the role of the Secretary General; his/ her political functions regarding preventive diplomacy, that role must be consolidated. The seriousness of all problems calls for deep transformations. Mere reforms are not enough to recover that "we" all the peoples of the world are waiting for. More than just reforms we in Venezuela call for the foundation of a new United Nations, or as the teacher of Simón Bolívar, Simón Rodríguez said: "Either we invent or we err." At the Porto Alegre World Social Forum last January different personalities asked for the United Nations to move outside the United States if the repeated violations to international rule of law continue. Today, we know that there were never any weapons of mass destruction in Iraq. The people of the United States have always been very rigorous in demanding the truth to their leaders; the people of the world demand the same. There were never any weapons of mass destruction; however, Iraq was bombed, occupied and it is still occupied. All this happened despite the United Nations. principles of equality and democracy. That is why we propose this to Assembly, that the United Nations should leave a country that does not respect the resolutions taken by this same Assembly. Some proposals have pointed out to Jerusalem as an international city as an alternative. The proposal is generous enough to propose an answer to the current conflict affecting Palestine. Nonetheless, it may have some characteristics that could make it very difficult to become a reality. That is why we are bringing a proposal made by Simón Bolívar, the great Liberator of the South, in 1815. Bolívar proposed then the creation of an international city that would host the idea of unity. We believe it is time to think about the creation of an international city with its own sovereignty, with its own strength and morality to represent all nations of the world. Such an international city has to balance five centuries of unbalance. The headquarters of the United Nations must be in the South. Ladies and gentlemen, we are facing an unprecedented energy crisis in which an unstoppable increase of energy demand is perilously reaching record highs, as well as the incapability to increase oil supply and the prospect of a decline in the known reserves of fuel worldwide. Oil is starting to become exhausted. For the year 2020, the daily demand for oil will be 120 million barrels. Such demand, even without counting future increments - would consume in 20 years what humanity has used up to now. This means that more carbon dioxide will inevitably be increased, thus warming our planet even more. occupied and it is still occupied. Hurricane Katrina has been a painful example of the cost of ignoring such realities. The warming of the oceans is the fundamental factor behind the increasing strength of the hurricanes we have witnessed in the last years. Let this occasion be an opportunity to send our deepest condolences to the people of the United States. Their people are brothers and sisters of all of us in the Americas and the rest of the world. It is unpractical and unethical to sacrifice the human race by appealing in an insane manner for the validity of a socio-economic model that has a galloping destructive capacity. It would be suicidal to spread it and impose it as an infallible remedy for the evils that are caused precisely by them. Not too long ago the President of the United States went to an Organization of American States meeting to propose Latin America and the Caribbean increase market-oriented policies, open market policies - that is neo-liberalism - when it is precisely the fundamental cause of the great evils and the great tragedies currently suffered by our people - the neoliberal capitalism, the Washington Consensus. All this has generated is a high degree of misery, inequality and infinite tragedy for all the peoples on his continent. What we need now more than ever Mr. President is a new international order. Let us recall the United Nations General assembly in its sixth extraordinary session in 1974, 31 years ago, where a new International Economic Order action plan was adopted, as well as the States Economic Rights and Duties Charter by an overwhelming majority, 120 votes for the motion, 6 against and 10 abstentions. all nations of the world. This was the period when voting was possible at the United Nations. Now it is impossible to vote. Now they approve documents such as this one [the new "outcome document"?] which I denounce on behalf of Venezuela as null, void and illegitimate. This document was approved violating the current laws of the United Nations. This document is invalid! This document should be discussed; the Venezuelan government will make it public. We cannot accept an open and shameless dictatorship in the United Nations. These matters should be discussed and that is why I petition my colleagues, heads of states and heads of governments, to discuss it. I just came from a meeting with President Néstor Kirchner and well, I was pulling this document out; this document was handed out five minutes before - and only in English - to our delegation. This document was approved by a dictatorial hammer which I am here to denounce as illegal, null, void and illegitimate. Hear this, Mr. President: if we accept this, we are indeed lost. Let us turn off the lights, close all doors and windows! That would be unbelievable: us accepting a dictatorship here in this hall. Now more than ever - we are saying - we need to retake ideas that were left on the road such as the proposal approved at this Assembly in 1974 regarding a New Economic International Order. Article 2 of that text confirms the right of states to nationalize the property and natural resources that belonged to foreign investors. It also proposed to create cartels of raw material producers. we have witnessed in the last years. In the Resolution 3021, May, 1974, the Assembly expressed its will to work with utmost urgency in the creation of a New Economic International Order based on - listen carefully, please - "the equity, sovereign equality, interdependence, common interest and cooperation among all states regardless of their economic and social systems, correcting the inequalities and repairing the injustices among developed and developing countries, thus assuring present and future generations, peace, justice and a social and economic development that grows at a sustainable rate." The main goal of the New Economic International Order was to modify the old economic order conceived at Breton Woods. We the people now claim - this is the case of Venezuela - a new international economic order. But it is also urgent to build a new international political order. Let us not permit a few countries to reinterpret the principles of International Law in order to impose new doctrines such as "pre-emptive warfare". Oh do they threaten us with that pre-emptive war! And what about the "Responsibility to Protect" doctrine? We need to ask ourselves, "Who is going to protect us? How are they going to protect us?" I believe one of the countries that require protection is precisely the United States. That was shown painfully with the tragedy caused by Hurricane Katrina; they did not have a government that protects them from a foreseen natural disaster, if we are going to talk about protecting each other; these are very dangerous concepts that shape imperialism, interventionism as they try to legalize the violation of national sovereignty. The full respect towards the principles of International Law and the United Nations Charter must be, Mr. President, the keystone for international relations in todays world and the base for the new order we are currently proposing. It is urgent to fight, in an efficient manner, international terrorism. Nonetheless, we must not use it as an excuse to launch unjustified military aggressions which violate international law. Such has been the doctrine following September 11. Only a true and close cooperation and the end of the double discourse that some countries of the North apply regarding terrorism, could end this terrible calamity. In just seven years of Bolivarian Revolution, the people of Venezuela can claim important social and economic advances. One million four hundred and six thousand Venezuelans learned to read and write. We are 25 million total. And the country will - in a few days - be declared an illiteracy-free territory. And three million Venezuelans, who had always been excluded because of poverty, are now part of primary, secondary and higher studies. days - be declared an illiteracy-free territory. of primary, secondary and higher studies. subsidized prices, almost half the population. Seventeen million Venezuelans - almost 70% of the population - are receiving, and, for the first time, universal healthcare, including the medicine, and in a few years, all Venezuelans will have free access to an excellent healthcare service. More than 1.7 million tons of food are channeled to over 12 million people at subsidized prices, almost half the population. One million gets them completely free, as they are in a transition period. More than 700,000 new jobs have been created, thus reducing unemployment by 9 points. All of this amid internal and external aggressions, including a coup d'etat and an oil industry shutdown organized by Washington. Regardless of the conspiracies, the lies spread by powerful media outlets, and the permanent threat of the empire and its allies, they even called for the assassination of a president. The only country where a person is able to call for the assassination of a head of state is the United States. Such was the case of a reverend called Pat Robertson, very close to the White House: He called for my assassination and he is a free person. That is international terrorism! We will fight for Venezuela, for Latin American integration and the world. We reaffirm our infinite faith in humankind. We are thirsty for peace and justice in order to survive as a species. Simón Bolívar, founding father of our country and guide of our revolution, swore to never allow his hands to be idle or his soul to rest until he had broken the shackles which bound us to the empire. Now is the time to not allow our hands to be idle or our souls to rest until we have saved humanity. Hurricane Hugo At The U.N.
Chavez Frias broke the news on arrival in the USA and has reminded reporters that the Venezuelan government had offered 8 electrical plants and drinking water supplies to help the homeless, aid which has been rejected. "If the Imperialist Government of the White House dares to invade Venezuela, the War of 100 Years will be unleashed in South America."